Our inflation outlook remains benign and economic data continues to be modestly positive. We do not anticipate a recession in the near term. Though the composition of the Fed will change over the next four months, we expect policy to continue toward tightening through increases in the fed funds rate and a reduction in the size of the Fed’s balance sheet. The larger allocation to intermediate-term investment grade bonds remains intact. However, we reduce exposure to speculative grade bonds due to spreads grinding to their tightest post-recession levels. Our growth/value even weight of 50/50 remains unchanged. We increase our exposure to non-U.S. developed and emerging market equities, the former with a tilt toward Europe, due to expectations for continued U.S. dollar softness and attractive valuations overseas. There are a number of potential pending changes to the policy and complexion of the U.S. Federal Reserve as of this writing. First, there are currently three, and soon to be four, open positions on the Board of Governors, the most important of which is the Fed chair. Though we are not expecting a dramatic near-term shift in the trajectory the current Fed has taken, the new arrangement could alter its policies as it is absorbed over the next few quarters. 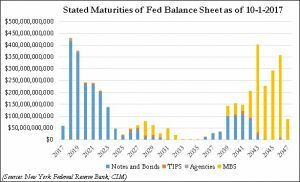 Second, the process of normalizing the nearly $4.5 trillion balance sheet is expected to commence in October as the Fed begins to slowly stop reinvesting the proceeds it receives from maturing bonds. Though the Fed stated it will start with a reduction of just $10 billion a month, over the next year the Fed’s current intention is to increase the amount to $50 billion each month. 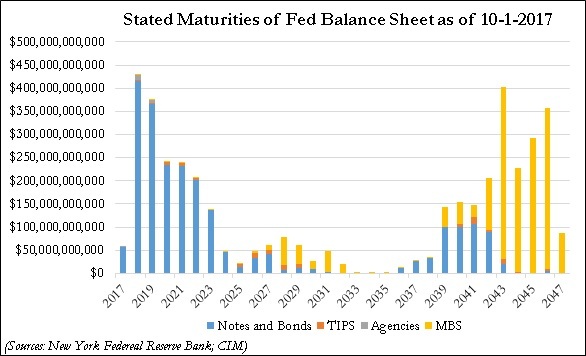 As this chart illustrates, a level of $50 billion each month will soon have the effect of shrinking the balance sheet. With the recent publication of the Fed’s minutes from the September meeting, the near-term trajectory seems fairly certain with expectations for another hike in the fed funds rate in December already priced into the market. Fed fund futures currently have an implied 80% probability of a December rate hike. However, the prospect for increases in the rate through 2018 as well as further implementation of quantitative tightening through the reduction in the balance sheet are dependent upon the composition of the Fed’s board. Given the Trump administration’s desire to strike a more populist appeal, it would not be surprising if the Fed adopts a more dovish posture in 2018. Such a pose would imply an extension of softness for the U.S. dollar versus other currencies. Regarding other domestic economic themes, inflation and unemployment remain at low levels, while consumer and business sentiment are elevated. Although the effects of the disastrous hurricane season and wildfires in northern California will likely weigh on GDP and employment over the next several quarters, we believe the dislocations will prove temporary. Outside the U.S., the European Central Bank (ECB) announced its intention to begin tapering the amount of its bond purchase program, but also indicated it would be extended further by nine months. We view this as the ECB maintaining its accommodative positioning while recognizing the strength in the underlying economy. It also underscores the ECB’s caution toward the myriad political developments in Europe, including Brexit, German and Austrian election results, the separatist movement in Spain and Italian elections in early 2018. The consequent economic impact holds a large degree of uncertainty, leading the ECB to lengthen its stimulus timeline. In the realm of geopolitics, though concerns attract headlines, we do not think the current issues hold meaningful implications for asset prices. Naturally, the prospect of armed conflicts with North Korea and/or Iran, or a complete revision of NAFTA, would have tremendous economic impact, but at this stage we do not find reason to be less than sanguine. Accordingly, our allocation of assets among each of the strategies currently reflects an accommodation of risk. The benign inflationary environment has been a positive backdrop for equity valuations and our expectations are that it should remain favorable. Though this year’s equity market advances thus far have been stronger than many experts expected, we remain positive on the outlook for equities over the forecast period absent an exogenous event or a surprising change in inflation expectations. While we recognize that equity pricing, particularly in large caps, remains close to historical highs as measured by traditional valuation metrics of Price/Earnings, Price/Book and Price/Cash Flow, we remain optimistic over the near term. Moreover, we harbor some concerns that equity markets could exhibit a “melt up” over the next 1-2 years as investors who have remained on the sidelines since the beginning of this bull market capitulate and put their excess cash to work, thereby fueling demand for equities and inflating prices further. As we recently published in our Asset Allocation Weekly (10/13/17), the parameters surrounding long-term S&P 500 trends remain supportive. 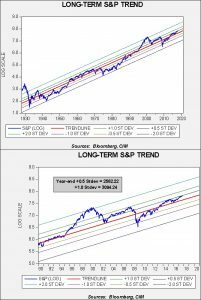 Although a recession or geopolitical event would carry consequent risk to equity prices, the regression trend lines on the accompanying charts indicate that the S&P 500 is trading within one-half standard error of the 6% average yearly trend. For context, the top chart displays log-transformed weekly Friday closes of index data since 1929, while the lower chart shows a more recent period beginning in 1990. The same regression trend lines are used on both charts. The Confluence Asset Allocation Committee recognizes that the U.S. economy is well advanced in terms of the economic cycle. In fact, the end of October will mark the 100th month for the current economic expansion, making this the third longest on record. However, economic conditions and associated market values fail to conform to the rigor of a calendar. We remain cognizant of the length of the expansion and are wary of the potential of a slowdown in economic growth over the forecast period. Nevertheless, as equity markets continue to advance, the Confluence Cyclical Asset Allocation strategies retain their historically high allocations to equities, inclusive of non-U.S. equities. It should be noted that this quarter’s rebalance further increases non-U.S. equity exposure, owing to the committee’s prevailing view that there is a likelihood of continued softness in the U.S. dollar coupled with favorable non-U.S. equity valuation metrics as compared to U.S. counterparts. Within U.S. large caps, we favor energy, health care, industrials and materials and underweight telecom, utilities and consumer staples. We maintain a neutral growth/value style bias. Despite the Fed’s decision to leave the fed funds rate unchanged at its September meeting, the probability for a 0.25% hike in December has increased. Over the forecast period, we envision the terminal rate of fed funds to be between 1.75% and 2.50%, with the differential dependent upon the make-up of the Fed’s Board of Governors and overall economic conditions. Given these expectations, there is the increased likelihood of a continued flattening of the Treasury yield curve due to tighter monetary conditions. Among corporate bonds, spreads for both investment grade and speculative grade bonds versus maturity equivalent Treasuries have tightened to post-recession lows. Considering current conditions and expectations, we lengthen the overall duration slightly, though with an increase in Treasury exposure and a continued concentration in the intermediate segment of the yield curve. In addition, we decrease the overall exposure to speculative grade bonds, a position we find appropriate given tighter spreads and as the Fed embarks upon normalizing its balance sheet. Similar to last quarter, we determined that commodities do not hold near-term appeal. Commodities can be helpful to a diversified portfolio in an environment of faster economic growth and/or a surge in inflation expectations; however, as these conditions remain absent, commodities are not currently represented in the strategies.